This ambitious project takes a cheeky look at the dark side of the corporate ladder. When Randy Brososky applied for a film grant in 2014 to shoot his web series, Necessary Evil, he didn’t fully realize just how much effort the journey ahead would entail. Necessary Evil is Brososky’s take on literal corporate hell, where demons are also office workers climbing the corporate ladder. Brososky wrote, produced and played the male lead in Necessary Evil‘s current three incarnations funded by Telus STORYHIVE: A pilot, a spin-off standalone short film and the first six episodes of a web series. Funding is the single biggest hurdle standing in the way of any film project. Even a modest short film, like Necessary Evil‘s 10-minute pilot, costs several thousand dollars. The amounts provided by STORYHIVE – starting at $10,000 and going up from there, depending on the project – may seem tiny compared to the budgets of Hollywood blockbusters, but they can make all the difference to a young filmmaker. Brososky discovered the STORYHIVE program at NAIT’s StoryWorld Quest event in 2014. At the time, there were only three days left before the next funding deadline. But Brososky managed to put together a successful bid and secured $10,000 to shoot a pilot for his series. A second application netted another $10,000, which he used to shoot a spin-off short film called Recruiting Hell. Brososky was also paired with Toronto-based filmmaker Mike Fly, and screenwriting instructor Rudy Thauberger, for mentorship and support. Then, in the spring of 2018, he shot the first six episodes of the Necessary Evil series. 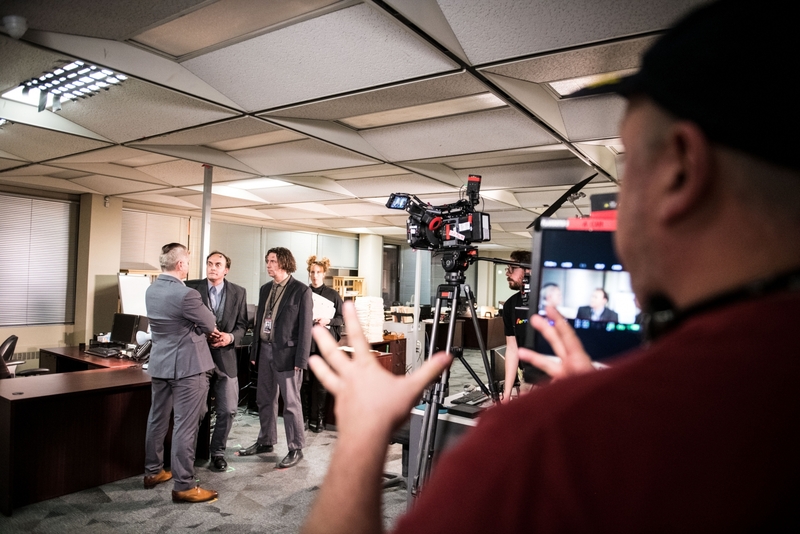 The total cost of that project, which included additional STORYHIVE funding, grants from the provincial and federal government, and private funding sources, broke even around $155,000. The first two films went over budget by about $3,000 each, which Brososky paid for out of pocket. The Necessary Evil pilot and Recruiting Hell short are available to stream on Telus Optik TV, as well as its YouTube channel. The six episodes of the web series debuts at the Edmonton International Film Festival on Sept. 28, and were also added to Optik TV. Telus doesn’t bury STORYHIVE projects under a separate category on its streaming service, either – they appear alongside major American releases in an effort to provide greater audience exposure. The majority of Necessary Evil‘s cast and crew were Edmontonians. Filming took place in Alberta and all the post-production is being done here. Edmonton has a pool of experienced film professionals to draw from – but the trouble is, they don’t always stick around. Jorgensen is also an instructor at NAIT and chair of Alberta Media Production Industries Association (AMPIA). He says that it’s easy for film producers – like himself and Brososky – to live in Alberta. But it’s a lot harder for professionals who need to be in the same location where the film is actually being made, such as crew members or actors. In 2016, roughly 400 television series were filmed in North America; 108 of those were done in BC. Alberta did five. B.C. has over 17,000 full-time jobs in the film industry; Alberta has less than 3,000. Currently, Alberta funds film through the Screen-Based Production Grant (SPG), which replaced the former Alberta Production Grant (APG). The SPG covers 30 per cent of a production’s budget, up to $7.5 million, on expenditures made in Alberta. The total grant money available each year is about $45 million. The federal government also offers the Canadian Film or Video Production Tax Credit (CPTC) which is a refundable tax credit of 25 per cent of qualified labour expenditures, up to 60 percent of production cost (therefore setting the maximum credit available at 15 per cent of production cost net of assistance). Brososky received funding through the former APG program and the CPTC. B.C., and every other province and territory in Canada except Yukon, offers a tax credit for film. B.C.’s credit has no cap, either, which encourages big-budget projects to set up shop. This is why so many major U.S. television series have filmed in Vancouver – and why so many Albertans end up going west to work in film. In light of this, AMPIA is working on developing relationships with the Shanghai and Guangdong film associations. China is the world’s biggest content consumer, with over 500 million active filmgoers. Jorgensen sees this as a huge opportunity to bring potential future co-productions to Alberta. But there’s a downside to having an industry dominated by large, foreign-owned service productions: when those projects wrap up, that’s it – there’s no work until the next one comes along. Brososky owns the intellectual property (IP) for Necessary Evil so he has the opportunity to earn future revenue if he can successfully commercialize it. That’s the key to building a truly sustainable local screen media industry, according to Josh Miller, CEO of the Edmonton Screen Industries Office (ESIO). The ESIO was incorporated as a non-profit in May 2017 to replace the Edmonton Film Commission. They’ve been granted a two-year operating budget of $530,000 and also secured nearly $4 million in funding that had been left in limbo after the Film Commission dissolved. The ESIO plans to support and develop the local film, TV and interactive digital media industry through five programs: IP acquisition and development, networking and marketing, market intelligence, corporate branding and a marquee production incentive (which are aspects that raise a projects profile, like a celebrity voiceover). It will begin accepting applications in 2019. Successful applicants will be chosen on individual merit. The local film industry sorely needs industry infrastructure like what the ESIO and AMPIA are planning. In working on Necessary Evil, Brososky felt like he had to start from scratch at each stage in the process. Better ground-level support would mean fewer barriers for local film projects, and, in turn, increased future successes. Perhaps that may even spur provincial legislators to view the film industry from an economic diversification lens, instead of just a facet of arts and culture.